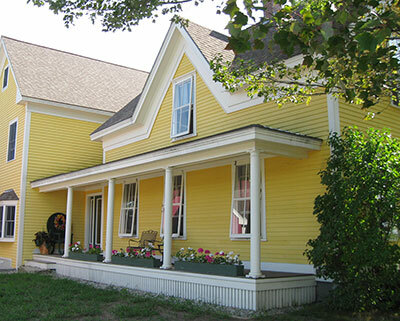 Farmhouse with energy efficient storm windows. The concept of energy conservation in buildings is not new. Throughout history building owners have dealt with changing fuel supplies and the need for efficient use of these fuels. Gone are the days of the cheap and abundant energy of the 1950’s. Today with energy resources being depleted and the concern over the effect of greenhouse gases on climate change, owners of historic buildings are seeking ways to make their buildings more energy efficient. These concerns are key components of sustainability—a term that generally refers to the ability to maintain the environmental, social, and economic needs for human existence. The topic of sustainable or “green” building practices is too broad to cover in this brief. Rather, this preservation brief is intended to help property owners, preservation professionals, and stewards of historic buildings make informed decisions when considering energy efficiency improvements to historic buildings. Figure 1. A decorative, stained glass skylight allows natural daylight into the interior. Sound energy improvement measures must take into consideration not only potential energy savings, but also the protection of the historic property’s materials and features. This guidance is provided in accordance with the Secretary of the Interior’s Standards for Rehabilitation to ensure that the architectural integrity of the historic property is preserved. Achieving a successful retrofit project must balance the goals of energy efficiency with the least impact to the historic building. Planning must entail a holistic approach that considers the entire building envelope, its systems and components, its site and environment, and a careful evaluation of the effects of the measures undertaken. Treatments common to new construction need to be evaluated carefully before implementing them in historic buildings in order to avoid inappropriate alteration of important architectural features and irreparable damage to historic building materials. This brief targets primarily small-to medium-size historic buildings, both residential and commercial. However, the general decision-making principles outlined here apply to buildings of any size and complexity. Before implementing any energy conservation measures, the existing energy-efficient characteristics of a historic building should be assessed. Buildings are more than the sum of their individual components. The design, materials, type of construction, size, shape, site orientation, surrounding landscape, and climate all play a role in how buildings perform. Historic building construction methods and materials often maximized natural sources of heat, light and ventilation to respond to local climatic conditions. The key to a successful rehabilitation project is to understand and identify the existing energy-efficient aspects of the historic building and how they function, as well as to understand and identify its character-defining features to ensure they are preserved. Whether rehabilitated for a new or continuing use, it is important to utilize the historic building’s inherent sustainable qualities as they were intended to ensure that they function effectively together with any new treatments added to further improve energy efficiency. Figure 2. Upper and lower shutters control daylight and provide privacy. Operable windows, interior courtyards, clerestories, skylights, rooftop ventilators, cupolas, and other features that provide natural ventilation and light can reduce energy consumption. Whenever these devices can be used to provide natural ventilation and light, they save energy by reducing the need to use mechanical systems and interior artificial lighting. Figure 3. Stone walls with substantial mass have high thermal inertia. Historically, builders dealt with the potential heat loss and gain from windows in a variety of ways depending on the climate. In cold climates where winter heat loss from buildings was the primary consideration before mechanical systems were introduced, windows were limited to those necessary for adequate light and ventilation. In historic buildings where the ratio of glass to wall is less than 20%, the potential heat loss through the windows is likely minimal; consequently, they are more energy efficient than most recent construction. In hot climates, numerous windows provided valuable ventilation, while features such as wide roof overhangs, awnings, interior or exterior shutters, venetian blinds, shades, curtains and drapes significantly reduced heat gain through the windows. Historic windows can play an important role in the efficient operation of a building and should be retained. New architectural styles, beginning with the International Style of the 1920’s, brought about an increase in the percentage of glazing in the total building envelope. By the 1950’s, with the advent of the glass curtain wall, glazing constituted nearly 100% of a building’s exterior walls in many buildings. While many early modern buildings continued to use operable windows as a way to provide natural ventilation, greater reliance on mechanical heating and air conditioning systems eventually reduced the function of exterior glazing to providing light only, particularly in commercial, office, and institutional buildings. Figure 4. A typical New England saltbox features a steeply sloping roof to shed snow and a floor plan organized around a central chimney to conserve heat. Thick masonry walls typical of the late-nineteenth and early-twentieth centuries have inherent thermal characteristics that keep the buildings cooler in the summer and warmer in the winter. Walls with substantial mass have the advantage of high thermal inertia, which reduces the rate of heat transfer through the wall. For instance, a wall with high thermal inertia, subjected to solar radiation for an hour, will absorb the heat at its outside surface, but slowly transfer it to the interior over a period as long as six hours. Conversely, a wall having the equivalent thermal resistance (R-value), but a substantially lower thermal inertia, will transfer the heat in perhaps as little as two hours. Heavy masonry walls also reduce the need for summer cooling. High thermal inertia is the reason many older public and commercial buildings without air conditioning still feel cool during the summer. The heat from the midday sun does not penetrate the buildings until late afternoon and evening, when it is less likely to be occupied or when exterior temperatures have fallen. Heavy masonry walls are also effective in moderating internal temperatures in the winter by dampening the overall peaks of heat gain and loss resulting in a flatter and more tolerable daily cycle. In areas that require cooling during the day and heating at night, masonry walls can help spread out excess heat gain from the day to cover some of the needed heating for the evening and night hours. Roof construction and design in historic buildings, particularly vernacular buildings, are strongly influenced by the conditions of the local climate. Wide overhangs that sometimes extend to create porches minimize the heat gain from the sun in warmer climates, while steep, sloping roofs with minimal or no overhang prevail in colder climates to allow for shedding snow and increasing beneficial solar heat gain through the windows. Materials and color also influence the thermal performance of roofs. Metal and light colored roofs, for example, reflect sunlight and thereby reduce the heat gain from solar radiation. Figure 5. The side porches of this house in Charleston, SC, shade the large windows and provide outdoor living spaces that take advantage of sea breezes. 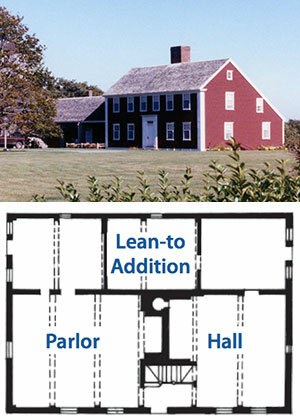 The floor plan of many historic buildings, particularly traditional vernacular ones, was also designed to respond to the local climate. In cold climates, rooms with low ceilings were clustered around central chimneys to share the heat, while small windows with interior shutters reduced drafts and heat loss. In warmer climates, wide central halls with tall ceilings, breezeways, and large porches all maximized air circulation. Site orientation was another factor considered especially in the location of a historic building on its property. In cold climates, buildings were oriented against northern winds while buildings in warm climates were sited to take advantage of prevailing breezes. Evergreen trees planted on the north side of buildings shielded from winter winds; deciduous trees planted to the south provided summer shade and maximum sun in the winter. Figure 6. 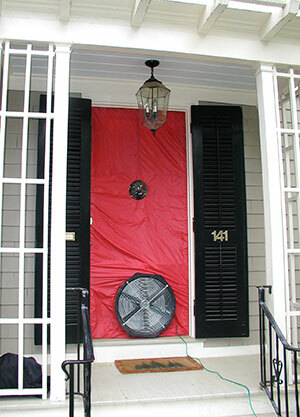 A blower door is used to depressurize a building by exhausting air at a rate that allows pressure gages and tracer smoke to measure the amount and location of air leakage. Photo: Robert Cagnetta, Heritage Restoration, Inc.
Before implementing any measures to improve the thermal performance of a historic building, an energy audit should be undertaken to evaluate the current energy use of the building and identify deficiencies in the building envelope or mechanical systems. In some areas, the local utility company may offer a free simple audit, however a more in-depth audit should be obtained from a professional energy auditor. The goal of the audit is to establish a baseline of building performance data to serve as a reference point when evaluating the effectiveness of future energy improvements. It is important to hire an independent auditor who does not have financial interests in the results, such as a product vendor. An energy auditor first documents the current energy use patterns in the building to establish an energy use history. This initial step includes obtaining the billing history from the local utility company over a one- or two-year period, as well as documenting the number of building occupants, how the building is used, and the type of fuel consumed. The location of any existing insulation is recorded and the approximate R-value of various components of the building envelope including walls, ceilings, floors, doors, windows and skylights is calculated. The building envelope is inspected to identify areas of air infiltration and air loss. The type and age of mechanical systems and major appliances are also recorded. Tools such as a blower door test or infrared thermography are useful to identify specific areas of infiltration, lack of insulation and thermal bridging. Mechanical depressurization along with infrared thermography is extremely useful in identifying locations of air leakage and heat loss followed by the use of tracer smoke to isolate specific air leaks. These tests are often challenging to perform on buildings and must be undertaken by experienced professionals to avoid misleading or inaccurate results. There are professional standards for audits, those of the Building Performance Institute (BPI) being the most widely used. 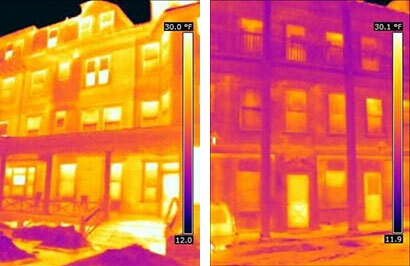 Figure 7.The left thermal image shows the walls of this building before insulating. After insulation was added, the cooler and, thus darker exterior walls evidence how much the heat loss has been reduced. Photos: EYP Architecture & Engineering. The energy auditor then produces a detailed report that documents the findings of the audit and includes specific recommendations for upgrades such as air sealing, adding insulation, general repairs, lighting, and improvements to or replacement of mechanical systems or major appliances. Cost estimates are provided for each of the improvements including the cost of implementation, potential operating cost savings, and, importantly, the anticipated payback period. Armed with this information, historic building owners can start to make informed decisions on how to improve the performance of their buildings. Usually the auditor finds a few locations where there is major air leakage; large “holes” that are unique to a particular building and require equipment to find them. These anomalies are often invisible to the people who use the building on a regular basis. It is important to retest the performance of the building following the implementation of any upgrades undertaken as a result of an energy audit to ensure that the upgrades are performing as expected. Figure 8. 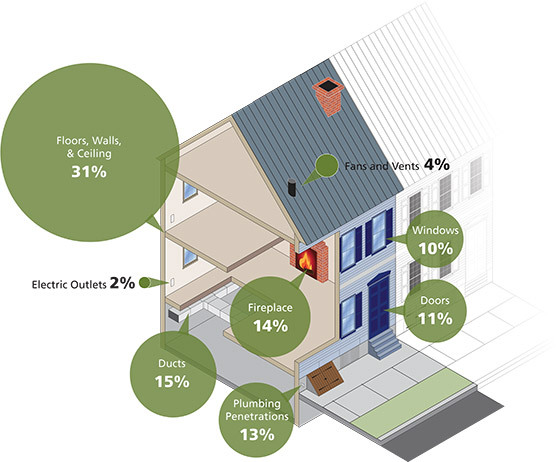 Where Air Escapes From a House (by percentage) – Image based on data from Energy Savers, U.S. Department of Energy. Illustration: Blank Space LLC. When implementing energy upgrades, efforts should be concentrated on improvements that will provide the most payback for the money expended and the least compromise to the historic character of the building. Some upgrades recommended in energy audits may not be introduced into a historic building feasibly without damaging historic fabric or altering the appearance of significant features. Removing historic siding and replacing it with new siding to introduce insulation into the wall cavity of a frame building or replacing repairable historic windows are examples of treatments that should not be undertaken on historic buildings. A common misconception is that replacing windows alone will result in major energy savings. This argument, often used to sell replacement windows, is simply not true. Although it varies from building to building, the U.S. Department of Energy (DOE) has documented that air loss attributable to windows in most buildings is only about 10% of the total air loss. Studies have shown that window replacement does not pay for itself in energy savings in a reasonable length of time. Moreover, there are ways to improve the performance of historic windows that do not require their replacement. In addition, historic windows can usually be repaired and are, thus, sustainable, while most new windows cannot be repaired, or even recycled, and may wind up in landfills. When considering energy upgrades, it is imperative to get a clear picture of what an improvement will cost initially and how long it will take to pay back the cost in energy savings. Therefore, the life cycle cost of the improvement must be considered as well as its impact on historic fabric. Reducing infiltration around existing windows and doors, sealing penetrations in the building envelope, and adding insulation—particularly in the attic where it has little impact on historic fabric—can result in significant improvements at relatively little cost. Updating mechanical systems or changing the way in which they are operated can also be cost-effective interventions. For example, installing a more efficient mechanical system alone may pay for itself in ten years. Reducing energy demands for heating and cooling may be accomplished in two steps. First, implement operational changes and upgrades to mechanical systems and major appliances—measures that do not require making alterations or adding new materials—to ensure that a building functions as efficiently as possible. After all these measures have been implemented, corrective work or treatments, such as weatherization, that require other alterations to the building may be considered. Figure 9. 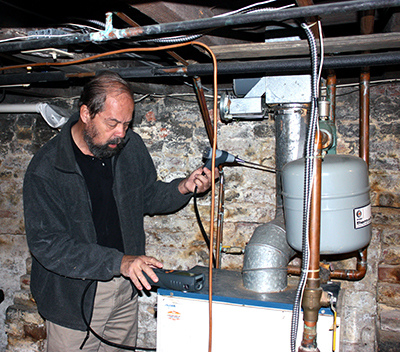 An energy auditor tests the efficiency of a boiler. One of the greatest effects on energy use is user behavior. Once an energy audit has established a baseline for the current energy use in a building, operational changes should be identified to control how and when the building is used to minimize the use of energy-consuming equipment. These changes can range from simple measures such as regular cleaning and maintenance of mechanical equipment to installing sophisticated controls that cycle equipment on and off in specified intervals for maximum performance. The following changes are recommended to reduce heating and cooling costs. Close off rooms that are not in use and adjust the temperature in those rooms. Do not condition rooms that do not need to be conditioned, thereby reducing the thermal envelope. Use insulated shades and curtains to control heat gain and loss through windows. Use operable windows, shutters, awnings and vents as originally intended to control temperature and ventilation. Install compact fluorescent lights (CFL) and light-emitting diode (LED) lights. Install motion sensors and timers for lighting and local ventilation, such as bathroom exhaust fans. Reduce “phantom” electricity loads by turning equipment off when not in use. Clean and service mechanical equipment regularly. These measures should be undertaken first to save energy in any existing building and are particularly appropriate for historic buildings because they do not require alterations to historic materials. In addition to maximizing the energy efficiency of existing building systems, substantial savings can be achieved through upgrading equipment and appliances. One should still weigh the operational savings against the initial cost of the new equipment, particularly if the existing equipment is not near the end of its life. Upgrade the heating system. It is important to install new furnaces that utilize outside combustion air to reduce air drawn into the building through uncontrolled infiltration. [All furnaces and boilers are now measured by their annual fuel utilization efficiency or AFUE.] Heating equipment is now more efficient and gas furnaces that used to have a 60% (AFUE) rating can now operate at as much as 90 to 97% efficiency. Upgrade the air conditioning system. Replace the water heater. High-efficiency water heaters use far less energy than earlier models, and high-efficiency tankless water heaters heat water on demand and offer even greater savings. Point of use water heat can also reduce costs and water consumption by reducing the time it takes to draw hot water. Upgrade appliances. Energy Star appliances, particularly refrigerators, washing machines and dishwashers can all reduce electricity use and additional indoor heating loads. In addition to operational and mechanical upgrades, it can be possible to upgrade many building components in a manner that will not jeopardize the historic character of the building and can be accomplished at a reasonable cost. The goal of these upgrades is to improve the thermal performance of the building, resulting in even greater energy savings. Retrofit measures to historic buildings should be limited to those that achieve at least reasonable energy savings, at reasonable costs, with the least impact on the character of the building. The following list includes the most common measures proposed to improve the thermal performance of an existing building; some measures are highly recommended for historic buildings, but others are less beneficial, and can even be harmful to a historic building. Figure 10. The pattern of air movement referred to as the ”stack effect”. Illustration: Blank Space LLC. Seal and insulate ducts and pipes. Weather strip doors and add storm doors. Add awnings and shading devices where appropriate. Add insulation to wood-frame walls. Add insulation to masonry walls. Install cool roofs and green roofs. The treatments listed first have less potential to negatively impact the historic fabric of a building. They tend to be less intrusive, are often reversible, and offer the highest potential for energy savings. Undertaking any of the treatments in the second group, however, may pose technical problems and damage to historic building materials and architectural features. Their installation costs may also outweigh the anticipated energy savings and must be evaluated on a case-by-case basis with advice from professionals experienced in historic preservation and building performance. Reduce air leakage. Reducing air leakage (infiltration and exfiltration) should be the first priority of a preservation retrofit plan. Leakage of air into a building can account for 5 to 40 percent of space-conditioning costs, which can be one of the largest operational costs for buildings.1 In addition, unwanted air leakage into and out of the building can lead to occupant comfort issues resulting from drafts. Air infiltration can be especially problematic in historic buildings because it is closely linked to increased moisture movement into building systems. Figure 11. Air infiltration and exfiltration. Illustration: Blank Space LLC. Air flow into and out of buildings is driven by three primary forces: wind pressure, mechanical pressure and the stack effect. Cold outside air that infiltrates the building through big holes, as well as through loose windows, doors, and cracks in the outer shell of the building, causes the heating system to work harder and consume more energy. In a multi-story building, cold air that enters the building at lower levels, including the basement or crawlspace, will travel up through the building and exit out leaky windows, gaps around windows and the attic as a result of temperature and pressure differential. This pattern of air movement is called the “stack effect.” Not only is valuable conditioned air lost, but damaging moisture may also enter the wall cavities and attic spaces. To stop the stack effect, the top and bottom of the exterior walls, inter-floor bypasses, and any existing chases or shafts must be sealed, or “draft proofed.” The use of spray foam sealants in basement and attic cracks is a particularly useful technique for reducing air infiltration. Adding weatherstripping to doors and windows, sealing open cracks and joints at the base of walls and around windows and doors, sealing off recessed lighting fixtures from above, and sealing the intersection of walls and attic, will substantially reduce air leakage. When using exterior caulk to seal the intersection of siding and doors or windows, do not caulk the underside of clapboards or below windows to allow any liquid water to escape. When infiltration and, consequently, exfiltration are reduced, mechanical ventilation may be necessary to meet occupants’ requirements for fresh air. Add attic or roof insulation. Heat loss and gain caused by increased interior/exterior temperature differentials primarily due to the stack effect and solar radiation are greatest at the top of a building. Therefore, reducing heat transfer through the roof or attic should be one of the highest priorities in reducing energy consumption. Adding insulation in unoccupied, unfinished attics is not only very effective from an energy-savings perspective, but it is also generally simple to install and causes minimal disruption to historic materials. The U.S. Department of Energy (DOE) provides a recommended R-value chart based on climate zones to help determine the optimal amount of insulation that should be installed in a particular project. Local codes may also have specific insulation requirements. Insulating trap or access doors should not be overlooked. Even though they may be small, attic doors can be responsible for substantial heat loss and should be addressed as part of any attic insulation project. Figure 12. 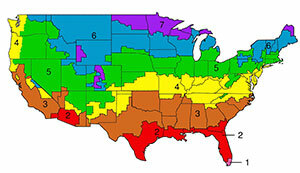 DOE Climate Zone MapRecommended energy improvements vary widely based on climate. The information contained in this document is based primarily on the available data for the Northeast and Mid-Atlantic regions. In unfinished and unheated attics, the insulation material is typically placed between the floor joists using blown-in, batt, or rigid foam insulation. When using fiberglass batts faced with a vapor retarder, the vapor retarder should be face down towards the heated interior. However, the use of a vapor retarder is not necessary in attic applications. If additional batt insulation is being added over existing insulation that is near or above the top of the joists, new un-faced batts should be placed perpendicular to the old ones to cover the top of the joists and reduce thermal bridging through the frame members. In low-pitched roofs, or where installing batt insulation is difficult, a more complete coverage of the attic floor may be achieved by using blown-in insulation. Unfinished attics must be properly ventilated to allow excess heat to escape. Radiant barriers may be used in attics to reduce thermal radiation across the air space between the roof deck and the attic floor in order to reduce summer heat gain. They are most beneficial in reducing cooling loads in hot climates and consist of a highly reflective sheet or coating, usually aluminum, applied to one or both sides of a flexible material. They are effective only when the foil surface faces an air space, and as long as the surface remains shiny – that is, free from dirt, dust, condensation and oxidation. Radiant barriers should not be installed directly over insulation on the attic floor, as they can act as vapor retarders and trap moisture in the insulation unless they are perforated. Their placement should be ventilated on both sides. Insulating the underside of the roof rather than the attic floor increases the volume of the thermal envelope of the building, thus making this treatment inherently less energy efficient. However, when mechanical equipment and/or ductwork are housed in an attic space, placing the insulation under the roof and treating the attic as a conditioned space is strongly recommended. This treatment allows the equipment to operate more efficiently and can prevent moisture-related problems caused by condensation on the mechanical equipment. Figure 13. Sample installation of a radiant barrier. Figure 14. Sample installation of rigid foam insulation, tapered at the edge to avoid altering the appearance of the roof. When insulation is placed under the roof, all vents in the attic and the intersection between the walls and roof rafters must be sealed. Rigid foam or batt insulation placed between the roof rafters is a common method of insulating the underside of a roof. Open cell spray foam (.5lb/cuft) may sometimes be applied under the roof deck only when there are no gaps in the sheathing which could allow the foam to expand under slates or shingles, preventing the re-use of the roofing material. Also, if roof leaks do occur, they may go undetected until after major damage occurs. Consideration must also be given to the irreversibility of this procedure because the foam enters the pores of the wood. It may be more advisable to install a breathable layer of material that will allow for future removal without leaving a residue. 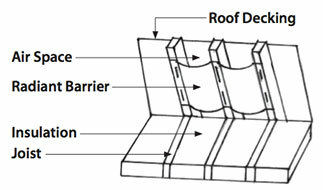 When total roof replacement is required because of deterioration, installing rigid foam insulation on top of the roof deck before laying the new roofing material can be simple and effective, particularly on low-pitched or flat roofs. However, the added thickness of the roof caused by installing rigid foam can alter the appearance of projecting eaves, dormers, and other features. If this application would significantly alter the appearance of these features, consider other methods. Install storm windows. The addition of metal or wood exterior or interior storm windows may be advisable to increase the thermal performance of the windows in ways that weatherstripping and caulking cannot address. A single-glazed storm window may only increase a single-pane window’s thermal resistance to R2, however, that is twice as good as a single-glazed window alone. It will make a noticeable contribution to the comfort level of the building occupant, with the added benefit of protecting the historic window from weathering. Using clear, non-tinted, low-e glass in the storm window can further increase the thermal performance of the window assembly without the loss of historic fabric. Studies have shown that the performance of a traditional wood window with the addition of a storm window can approach that of a double-glazed replacement window.2 Some storm windows are available with insulated low-e glass, offering even higher thermal performance without the loss of the historic window. Furthermore, a storm window avoids the problem of irreparable seal failure on insulated glass units (IGUs) used in modern replacement windows. While the lifespan of the IGU depends both on the quality of the seal and other factors, it is unreasonable to expect more than 25 years. Once the seal fails, the sash itself will usually need to be entirely replaced. By providing an additional insulating air space and adding a barrier to infiltration, storm windows improve comfort and reduce the potential for condensation on the glass. To be effective and compatible, storm windows must be tight fitting; include a sealing gasket around the glass; align with the meeting rail of the primary sash; match the color of the sash; and be caulked around the frame to reduce infiltration without interfering with any weep holes. Whether a storm window or the historic window itself, the interior window must be the tighter of the two units to avoid condensation between the windows that can occur in a cold climate that requires indoor heating. Condensation is a particular concern if it collects on the historic window, as can easily happen with a loose-fitting, storm window. While interior storm windows can be as thermally effective as exterior storm windows, appropriate gaskets must be used to ensure that damage-causing condensation does not form on the inside face of the historic window. Opening or removing the interior storm windows during non-heating months also helps to avoid the negative effects of moisture build-up. Figure 15. 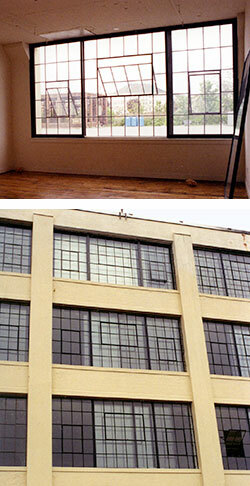 Original steel windows were retained and made operable during the rehabilitation of this historic mill complex. Insulated sliding windows were added on the interior to improve energy efficiency. For large, steel industrial windows, the addition of interior, insulated sliding glass windows that align with the primary vertical mullions has proven to be a successful treatment that allows the primary window to remain operable. Insulate basements and crawlspaces. The first step in addressing the insulation of basements and crawl spaces is to decide if they are to be part of the conditioned space and, therefore, within the thermal envelope of the building. If these areas are kept outside the thermal envelope of the building and treated as unconditioned areas, insulating between the floor joists on the underside of the subfloor is generally recommended. Alternatively, rigid foam insulation installed over the bottom of the floor joists on the basement or crawlspace side may also be used. All gaps between the unconditioned and conditioned areas of the building, including the band joists, should be air sealed to prevent air infiltration into the upper levels of the building. If the crawlspace contains mechanical equipment, or if high levels of moist air enter the crawlspace through vents during the summer months, it is advisable to include the crawlspace within the thermal boundary of the building. 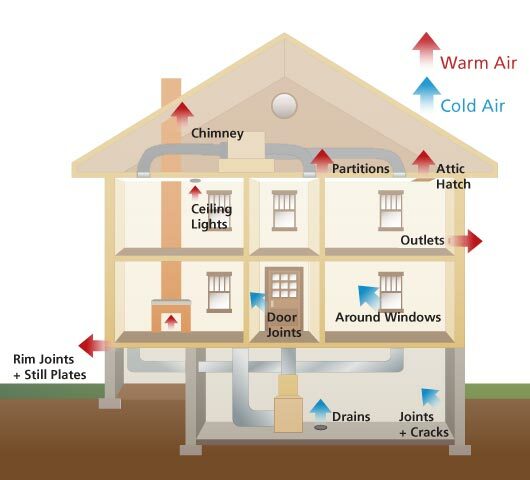 As in attics, water vapor can condense on ducts and other equipment located in unconditioned basements and crawlspaces. 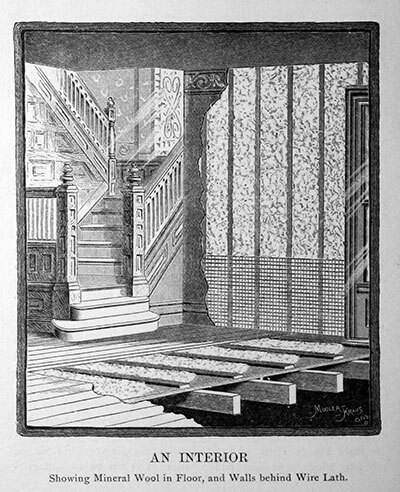 In the past, building codes routinely required that crawlspaces be treated as non-conditioned spaces and be ventilated. However, this has not proven to be a best practice in all cases. Ventilation through crawlspace vents does not keep the space dry during humid summers. All vents should be sealed and access doors weather-stripped. Rigid foam insulation installed on the interior face of the wall is recommended for basement and crawlspace foundation walls, only after all drainage issues have been addressed. Special attention should be given to ensure that all the joints between the insulation boards are sealed. A moisture barrier on exposed dirt in a crawlspace is strongly recommended to prevent ground moisture from entering the building envelope. Whenever feasible, pouring a concrete slab over a moisture barrier in crawlspaces or basements with exposed dirt floors should be considered. Seal and insulate ducts and pipes. A surprisingly enormous amount of energy is wasted when heated or cooled air escapes from supply ducts or when hot attic air leaks into air conditioning return ducts. Based on data collected in energy audits, as much as 35 percent of the conditioned air in an average central air conditioning system may escape from the ducts.3 Care must be taken to completely seal all connections in the duct system and adequately insulate the ducts, especially in unconditioned spaces. This loss of energy is another reason to treat attics, basements and crawlspaces as conditioned spaces. Ducts located in unconditioned spaces should be insulated based on the recommendations for the appropriate climate zone. Hot water pipes and water heaters should be insulated in unconditioned spaces to retain heat, and all water pipes insulated to prevent freezing in cold climates. Weather strip doors and add storm doors. Historic wood doors are often significant features and should always be retained, rather than replaced. While an insulated replacement door may have a higher R-value, doors represent a small area of the total building envelope, and the difference in energy savings after replacement would be insignificant. The doors and frames should, however, have proper maintenance including regular painting, and the addition or renewal of weatherstripping. Storm doors can improve the thermal performance of the historic door in cold climates and may be especially recommended for a door with glazing. The design of the storm door should be compatible with the character of the historic door. A fully glazed storm door with a frame that matches the color of a historic door is often an appropriate choice because it allows for the historic door to remain visible. Storm doors are recommended primarily for residential buildings. They are not appropriate for commercial or industrial buildings. These buildings never had storm doors, because the doors were opened frequently or remained open for long periods. It may also not be appropriate to install a storm door on a highly significant entrance door. 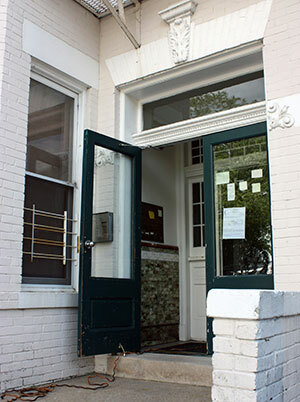 In some instances, the addition of a storm door could add significant heat gain on certain exposures or in hot climates, which could degrade the material or finish of the historic door. Add awnings and shading devices. Awnings and other shading devices can provide a considerable reduction of heat gain through windows and storefronts. Keeping existing awnings, or replacing them if previously removed, is a relatively easy way to enhance the energy performance of a building. Awnings should only be installed when they are compatible with the building type and character. In building types that did not have awnings historically, interior shades, blinds or shutters should be considered instead. A wide range of shades, blinds and shutters is available for use in all types of buildings to control heat gain or loss through windows, as well as lighting levels. When properly installed, shades are a simple and cost-effective means of saving energy. Some shade fabrics block only a portion of the light coming in—allowing the use of natural light—while others block all or most of the light. 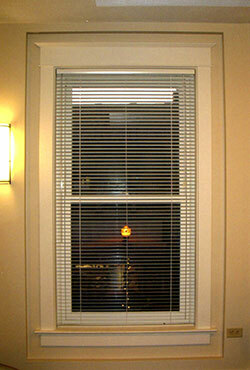 The light-colored or reflective side of the shades should face the window to reduce heat gain. Quilted roller shades feature several layers of fiber batting and sealed edges, and these shades act as both insulation and an air barrier. They control air infiltration more effectively than other soft window treatments. Pleated or cellular shades provide dead air spaces within the cells to add insulation value. These shades, however, do not measurably control air infiltration. Retractable awnings and interior shades should be kept lowered during the summer to prevent unwanted heat gain, but raised in the winter to take advantage of the heat gain. Interior shades, especially those that have some insulation value, should be lowered at night during the winter months. Light shelves are architectural devices designed to maximize daylight coming through windows by reflecting it deeper into the building. These horizontal elements are usually mounted on the interior above head height in buildings with high ceilings. Although they can provide energy savings, they are not compatible with most historic buildings. In general, light shelves are most likely to be appropriate in some industrial or modernist-style buildings, or where the historic integrity of interior spaces has been lost and they can be installed without being visible from the exterior. Figure 16. Historic vestibules retain conditioned air in the living spaces. Add interior vestibules. Vestibules that create a secondary air space or “air lock” are effective in reducing air infiltration when the exterior door is open. Exterior and interior vestibules are common architectural features of many historic buildings and should be retained wherever they exist. Adding an interior vestibule may also be appropriate in some historic buildings. 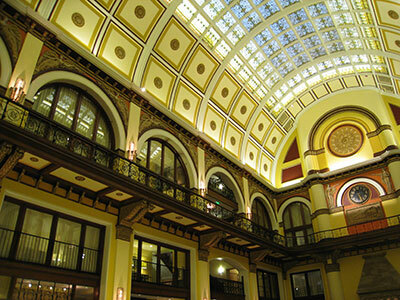 For example, new glazed interior vestibules may be compatible changes to historic commercial and industrial buildings. New exterior vestibules will usually result in too great a change to the character of primary entrances, but may be acceptable in very limited instances, such as at rear entrances. Even in such instances, new vestibules should be compatible with the architectural character of the historic building. Replace windows. Windows are character-defining features of most historic buildings. As discussed previously, the replacement of a historic window with a modern insulated unit is not usually a cost-effective choice. Historic wood windows have a much longer service life than replacement insulated windows, which cannot be easily repaired. Therefore, the sustainable choice is to repair historic windows and upgrade their thermal performance. However, if the historic windows are deteriorated beyond repair, if repair is impractical because of poor design or material performance, or if repair is economically infeasible, then replacement windows may be installed that match the historic windows in size, design, number of panes, muntin profile, color, reflective qualities of the glass, and the same relationship to the window opening. Other options should also be considered before undertaking complete window replacement. If only the sash is severely deteriorated and the frame is repairable, then only the sash may need to be replaced. If the limited lifespan of insulated glass is not a concern, the new sash can be made to accommodate double glazing. Where the sashes are sound, but improved thermal performance without the use of a storm window is desired, some windows may be retrofitted with insulated glass. If the existing sash is of sufficient thickness, it may be routed to accept insulated, clear low-e glass without extensive loss of historic material or historic character. When insulated glass is added in a new or retrofitted sash, any weights will have to be modified to accommodate the significant extra weight. Adding wall insulation must be evaluated as part of the overall goal to improve the thermal efficiency of a building and should only be considered after the installation of attic and basement insulation. Can this goal be achieved without the use of wall insulation? Can insulation be added without causing significant loss of historic materials or accelerated deterioration of the wall assembly? Will it be cost effective? These are basic questions that must be answered before a decision is made to insulate the walls and may require professional evaluation. Figure 17. Illustration of insulation from the 1889 trade catalog “The Uses of Mineral Wool in Architecture, Car Building and Steam Engineering”. Collection Centre Canadien d’Architecture/Canadian Centre for Architecture, Montreal, Canada. Add insulation to wood-frame walls. Wood is particularly susceptible to damage from high moisture levels; therefore, addressing existing moisture problems before the addition of insulation is essential. Un-insulated historic wood buildings have a higher rate of air infiltration than modern buildings; while this makes older buildings less efficient thermally, it helps dissipate the unwanted moisture and thus keeps building assemblies dry. Climate, building geometry, the condition of the building materials, construction details, and many other factors make it difficult to assess the impact that adding insulation will have on reducing the air flow and, hence, the drying rate in a particular building. For this reason, predicting the impact of adding insulation to wood-frame walls is difficult. 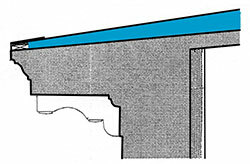 Insulation Installed in the Wall Cavity: When sheathing is part of the wall assembly, and after any moisture-related problems have been addressed, adding insulation to the interior cavity of a wood-frame wall may be considered. Adding insulation in a wall where there is no sheathing between the siding and studs is more problematic, however, because moisture entering the wall cavity through cracks and joints by wind-driven rain or capillary action will wet the insulation in contact with the back of the siding. Installing blown-in insulation, either dense-packed cellulose or fiberglass, into the wall cavity causes the least amount of damage to historic materials and finishes when there is access to the cavity walls, and it is therefore a common method of insulating wood-frame walls in existing buildings. In most cases, blowing insulation material into the wall cavity requires access through the exterior or interior wall surfaces. When historic plaster, wood paneling, or other interior historic decorative elements are present, accessing the cavity from the exterior is recommended by removing individual siding boards at the top of each wall cavity. In this manner the boards can be reinstalled without unsightly drill holes on the exterior. If the plaster is deteriorated and will require repair, then the wall cavity may be accessed from the interior through holes drilled through non-decorative plaster. Of the materials available, dense-packed cellulose fiber is most commonly used. Its R-value, ability to absorb and diffuse moisture, impediment to air flow, relatively simple installation, and low cost make it a popular choice. Cellulose insulation from most manufacturers is available in at least two grades that are characterized by the type of fire retardant added to the insulation. The fire retardants are usually: (1) a mix of ammonium sulfate and boric acid or (2) boric acid only (termed “borate only”). The recommended type of cellulose insulation for historic buildings is the “borate only” grade, as cellulose treated with sulfates reacts with moisture in the air and forms sulfuric acid which corrodes many metals. Optimum conditions for installing insulation inside the wall cavity occur in buildings where either the exterior materials or interior finishes have been lost, or where the materials are deteriorated beyond repair and total replacement is necessary. However, wholesale removal of historic materials either on the exterior or interior face of a historic wall to facilitate insulation is not recommended. Even when the exterior materials, such as wood siding, could potentially be reinstalled, this method, no matter how carefully executed, usually results in damage to, and loss of historic materials. Figure 18. Dense-packed cellulose insulation is being blown in through holes drilled in the sheathing. Once the operation has been completed, the shingles will be reinstalled. Photo: Edward Minch. If the wall cavity is open, the opportunity to properly install batt insulation is available. A tight fit between the insulation and the adjacent building components is critical to the performance of the insulation. Batt insulation must be cut to the exact length of the cavity. A batt that is too short creates air spaces above and beneath the batt, allowing convection. A batt that is too long will bunch up, creating air pockets. Air pockets and convection currents significantly reduce the thermal performance of insulation. Each wall cavity should be completely filled. Unfaced, friction-fit batt insulation fluffed to fill the entire wall cavity is recommended. Any air gaps between the insulation and the framing or other assembly components must be avoided. Batts should be split around wiring, pipes, ducts and other elements in the wall rather than be pushed or compressed around obstacles. When adding insulation to the sidewalls, the band joist area between floors in multi-story, platform-framed buildings should be included in the sidewall insulation retrofit. The R-value of the insulation installed in the band joist area should be at least equal to the R-value of the insulation in the adjacent wall cavities. In balloon-framed buildings, the wall cavity is continuous between floors except where fire stops have been inserted. The use of spray foam or foamed-in-place insulation would appear to have great potential for application in historic wood-frame buildings due to their ability to flow into wall cavities and around irregular obstacles. Their high R-value and function as an air barrier make them a tempting choice. However, their use presents several problems. The injected material bonds tightly to historic materials making its removal difficult, especially if it is encased in an existing wall. The pressure caused by the expansion rate of these foams within a wall can also damage historic material, including breaking the plaster keys or cracking existing plaster finishes. Figure 19. Band Joist. Platform framing. Insulation Installed on Either Side of the Wall: Batt, rigid foam board, and spray foam insulation are commonly added to the interior face of walls in existing buildings by furring-out the walls to accommodate the additional thickness. However, this often requires the destruction or alteration of important architectural features, such as cornices, base boards, and window trim, and the removal or covering of plaster or other historic wall finishes. Insulation installed in this manner is only recommended in buildings where interior spaces and features lack architectural distinction or have lost significance due to previous alterations. Figure 20. The walls have been furred out inappropriately around the historic window trim creating an appearance the interior never had historically. Adding rigid foam insulation to the exterior face of wood-frame buildings, while common practice in new construction, is never an appropriate treatment for historic buildings. 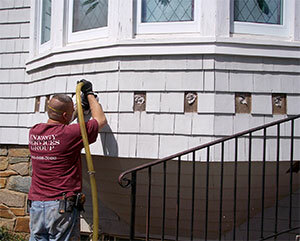 Exterior installation of the foam boards requires removal of the existing siding and trim to install one or more layers of polyisocyanurate or polystyrene foam panels. Depending on the amount of insulation added for the particular climate, the wall thickness may be dramatically increased by moving the siding as much as 4 inches out from the sheathing. Even if the historic siding and trim could be removed and reapplied without significant damage, the historic relationship of windows to walls, walls to eaves, and eaves to roof would be altered, which would compromise the architectural integrity and appearance of the historic building. 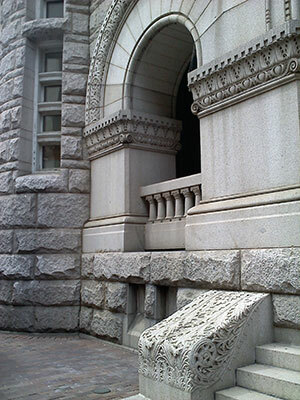 Solid Masonry Walls: As with frame buildings, installing insulation on the interior walls of a historic masonry structure should be avoided when it would involve covering or removing important architectural features and finishes, or when the added thickness would significantly alter the historic character of the interior. The addition of insulation on solid masonry walls in cold climates results in a decreased drying rate, an increased frequency of freeze-thaw cycles, and prolonged periods of warmer and colder temperatures of the masonry. These changes can have a direct effect on the durability of materials. Figure 21. 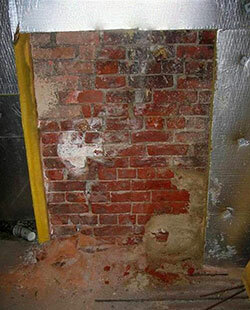 The interior face of a brick masonry wall shows damage that resulted from the installation of a vapor retardant (foil facing) and thermal insulation. Photo: Simpson Gumpertz & Heger. Extreme swings in temperature may also have negative effects on a historic masonry wall. The addition of insulation materials to a historic masonry wall decreases its ability to transfer heat; thus, walls tend to stay warm or cold for longer periods of time. In addition, walls exposed to prolonged solar radiation during winter months can also be subject to higher swings in surface temperature during the day. Deleterious effects due to stress caused by expansion and contraction of the building assembly components can result. Buildings with masonry materials of higher porosity, such as those built with low-fired brick, or certain soft stones, are particularly susceptible to freeze-thaw cycles and must be carefully evaluated prior to adding insulation. Inspection of the masonry in areas that are not heated such as parapets, exposed wing walls, or other parts of the building is particularly important. A noticeable difference in the amount of spalling or sanding of the masonry in these areas could predict that the same type of deterioration will occur throughout the building after the walls are insulated. Brick that was fired at lower temperatures was often used on the inside face of the wall or on secondary elevations. Even masonry walls faced with more robust materials such as granite may have brick, rubble, mortar or other less durable materials as backing. Spray foams are being used for insulation in many masonry buildings. Their ability to be applied over irregular surfaces, provide good air tightness, and continuity at intersections between, walls, ceilings, floors and window perimeters makes them well suited for use in existing buildings. However, the long-term effects of adding either open- or closed-cell foams to insulate historic masonry walls as well as performance of these products have not been adequately documented. Use of foam insulation in buildings with poor quality masonry or uncontrolled rising damp problems should be avoided. Periodic monitoring of the condition of insulated masonry walls is strongly recommended regardless of the insulation material added. Figure 22. Installation of both cool and green roofs in an urban environment. Install cool roofs and green roofs: Cool roofs and vegetated “green roofs” help to reduce the heat gain from the roof, thereby cooling the building and its environment. Cool roofs include reflective metal roofs, light-colored or white roofs, and fiberglass shingles that have a coating of reflective crystals. All of these roofing materials reflect the sun’s radiation away from the building, which lessens heat gain, resulting in a reduction of the cooling load. Cool roofs are generally not practical in northern climates where buildings benefit from the added heat gain of a dark-colored roof during colder months. Cool and green roofs are appropriate for use on historic buildings only when they are compatible with their architectural character, such as flat roofs with no visibility. A white-colored roof that is readily visible is not appropriate for historic metal roofs that were traditionally painted a dark color, such as green or iron oxide red. A white reflective roof is most suitable on flat roofed historic buildings. If a historic building has a slate roof, for example, removing the slate to install a metal roof is not a compatible treatment. It is never appropriate to remove a historic roof if the material is in good or repairable condition to install a cool roof. However, if the roof has previously been changed to an asphalt shingle roof, fiberglass shingles with special reflective granules may be an appropriate replacement. A green roof consists of a thin layer of vegetation planted over a waterproofing system or in trays installed on top of an existing flat or slightly sloped roof. Green roofs are primarily beneficial in urban contexts to reduce the heat island effect in cities and to control storm water run-off. A green roof also reduces the cooling load of the building and helps cool the surrounding urban environment, filters air, collects and filters storm water, and can provide urban amenities, including vegetable gardens, for building occupants. The impact of increased structural loads, added moisture, and potential for leaks must be considered before installing a green roof. 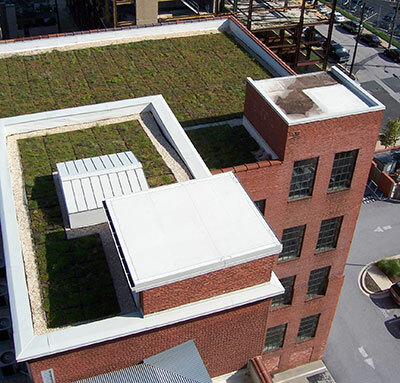 A green roof is compatible on a historic building only if the plantings are not visible above the roofline as seen from below. The issue of moisture in insulated assemblies is the subject of much debate. While there is no conclusive way to predict all moisture problems, especially in historic buildings, experts seem to agree on a few basic tenants. Exterior materials in insulated buildings become colder in the winter and stay wet longer following a rain event. While the wetness may not pose a problem for robust materials, it may speed the deterioration of some building materials, and lead to more frequent maintenance such as repainting of wood or repointing of masonry. Summer moisture problems are most commonly associated with excessive indoor cooling and the use of interior wall finishes that act as vapor retarders (paint buildup or vinyl wall coverings). Good air-sealing at the ceiling plane usually controls moisture in insulated attics. Although not the focus of this publication, alternative energy sources are dealt with in more detail in The Secretary of the Interior’s Standards for Rehabilitation & Illustrated Guidelines on Sustainability for Rehabilitating Historic Buildings and other NPS publications. Devices that utilize solar, geothermal, wind and other sources of energy to help reduce consumption of fossil fuel-generated energy can often be successfully incorporated in historic building retrofits. However, if the alterations or costs required to install these devices do not make their installation economically feasible, buying power generated off site from renewable sources may also be a good alternative. The use of most alternative energy strategies should be pursued only after all other upgrades have been implemented to make the building more energy efficient because their initial installation cost is usually high. Figure 23. Solar collectors installed in a compatible manner on low sloping sawtooth monitors. Top Photo: Neil Mishalov, Berkeley, CA. Solar Energy: Man has sought to harness the power of solar energy to heat, cool, and illuminate buildings throughout history. 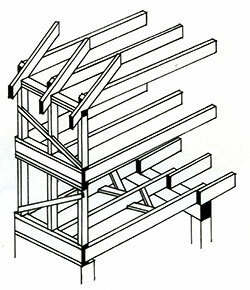 Construction techniques and design strategies that utilize building materials and components to collect, store, and release heat from the sun are described as “passive solar design.” As previously discussed, many historic buildings include passive solar features that should be retained and may be enhanced. Compatible additions to historic buildings also offer opportunities to incorporate passive solar features. Active solar devices, such as solar heat collectors and photovoltaic systems, can be added to historic buildings to decrease reliance on grid-source fossil-fuel powered electricity. Incorporating active solar devices in existing buildings is becoming more common as solar collector technology advances. Adding this technology to historic buildings, however, must be done in a manner that has a minimal impact on historic roofing materials and preserves their character by placing them in locations with limited or no visibility, i.e., on flat roofs at a low angle or on a secondary roof slope. Solar collectors used to heat water can be relatively simple. More complex solar collectors heat a fluid or air that is then pumped through the system to heat or cool interior spaces. Photovoltaic panels (PV) transform solar radiation into electricity. 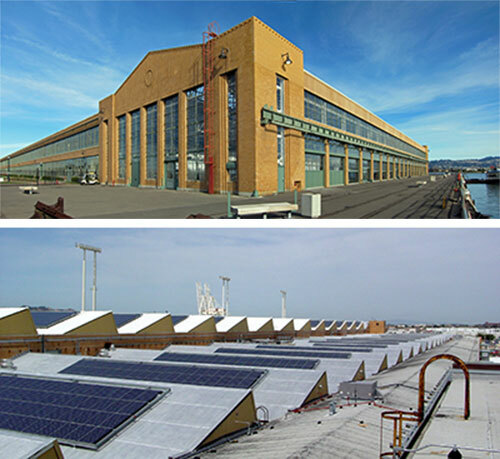 The greatest potential for the use of PV panels in historic buildings is on buildings with large flat roofs, high parapets, or roof configurations that allow solar panels to be installed without being prominently visible. The feasibility of installing solar devices in small commercial and residential buildings will depend on installation costs, conventional energy rates, and available incentives, all of which will vary with time and location. The same factors apply to the use of solar collectors for heating water, but smaller installations may meet a building’s need and the technology has a considerable track record. Geothermal Energy: The use of the earth’s heat is another source of readily-accessible clean energy. 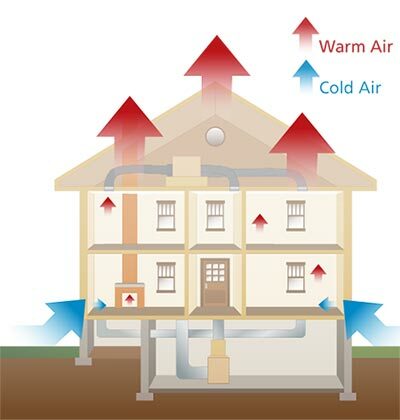 The most common systems that utilize this form of energy are geothermal heat pumps, also known as geo-exchange, earth-coupled, ground-source, or water-source heat pumps. Introduced in the late 1940s, geothermal heat pumps rely on heat from the constant temperature of the earth, unlike most other heat pumps which use the outside air temperature as the exchange medium. This makes geothermal heat pumps more efficient than conventional heat pumps because they do not require an electric back-up heat source during prolonged periods of cold weather. There are many reasons that geothermal heat pumps are well suited for use in historic buildings. They can reduce the amount of energy consumption and emissions considerably, compared to the air exchange systems or electric resistance heating of conventional HVAC systems. They require less equipment space, have fewer moving parts, provide better zone space conditioning, and maintain better internal humidity levels. Geothermal heat pumps are also quieter because they do not require external air compressors. Despite higher installation costs, geothermal systems offer long-term operational savings and adaptability that may make them a worthwhile investment in some historic buildings. Wind Energy: For historic properties in rural areas, where wind power has been utilized historically, installation of a wind mill or turbine may be suitable to the historic setting and cost effective. Before choosing to install wind-powered equipment, the potential benefit and the impact on the historic character of the building, the site and surrounding historic district must be analyzed. In order for the turbines to work effectively, average wind speeds of 10 mph or higher are necessary. This technology may not be practical in more densely-populated areas sheltered from winds or regions where winds are not consistent. In cities with tall buildings, there is potential for installing relatively small rooftop turbines that are not visible from the ground. However, because of the initial cost and size of some turbines, it is generally more practical to purchase wind power from an off-site wind farm through the local utility company. With careful planning, the energy efficiency of historic buildings can be optimized without negatively impacting their historic character and integrity. Measuring the energy performance of buildings after improvements are completed must not be overlooked, as it is the only way to verify that the treatments have had the intended effect. Ongoing monitoring of buildings and their components after alterations to historic building assemblies are completed can prevent irreparable damage to historic materials. This, along with regular maintenance, can ensure the long-term preservation of our historic built environment and the sustainable use of our resources. 1. John Krigger and Chris Dorsi, “Air Leakage,” in Residential Energy: Cost Savings and Comfort for Existing Buildings. Helena, Montana: Saturn Resource Management, 2004, p. 73. 2. Measured Winter Performance of Storm Windows. A 2002 study done by Lawrence Berkeley National Labs. 3. Midwest Weatherization Best Practices Field Guide. Prepared for the U.S. Department of Energy Weatherization Assistance Program, May 2007, p. 157. 4. Adapted from comments provided by William B. Rose, Research Architect, University of Illinois, April 2011. 5. U.S. Department of Energy, Insulation Fact Sheet, DOE/CE-0180, 2008, p.14. 6. Bradford S. Carpenter, P.E., LEED AP et al., The Designer’s Dilemma: Modern Performance Expectations and Historic Masonry Walls (paper presented at the RCI 2010 Symposium on Building Envelope Technology, San Antonio, Texas). Jo Ellen Hensley, Senior Architectural Historian, LEED Green Associate, and Antonio Aguilar, Senior Historical Architect, Technical Preservation Services Branch, National Park Service, revised Preservation Brief 3: Conserving Energy in Historic Buildings, written by Baird M. Smith, FAIA and published in 1978. The revised Brief contains expanded and updated information on the subject of energy efficiency in historic buildings. A number of individuals and organizations have contributed their time and expertise in the development of this Brief, beginning with the participants of the “Improving Energy Efficiency in Historic Buildings—A Round Table Symposium,” Washington, DC, 2002. Special thanks go to Mike Jackson, FAIA, Illinois Historic Preservation Agency; Edward Minch, Energy Services Group; William B. Rose, Research Architect, University of Illinois; Bradford S. Carpenter, P.E., LEED AP; and Mark Thaler, AIA, for their technical advice. The Advisory Council on Historic Preservation’s Sustainability Task Force, the General Services Administration’s Center for Historic Buildings, and our colleagues at the National Center for Preservation Technology and Training commented on the manuscript. In addition, the Technical Preservation Services professional staff, in particular Anne E. Grimmer, Michael J. Auer and John Sandor, provided critical and constructive review of the publication. This publication has been prepared pursuant to the National Historic Preservation Act of 1966, as amended, which directs the Secretary of the Interior to develop and make available information concerning historic properties. Comments about this publication should be addressed to: Charles E. Fisher, Technical Preservation Publications Program Manager, Technical Preservation Services, National Park Service, 1201 Eye Street, NW, 6th Floor, Washington, DC 20005. This publication is not copyrighted and can be reproduced without penalty. Normal procedures for credit to the authors and the National Park Service are appreciated. The photographs used in this publication may not be used to illustrate other publications without permission of the owners. Carpenter, Bradford S., et al., The Designer’s Dilemma: Modern Performance Expectations and Historic Masonry Walls. Paper presented at the RCI 2010 Symposium on Building Envelope Technology, San Antonio, Texas. Cavallo, James. 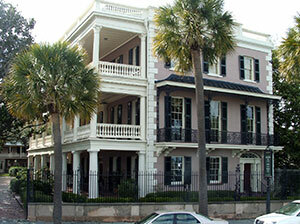 "Capturing Energy-Efficiency Opportunities in Historic Houses." APT Bulletin: The Journal of Preservation Technology. Vol. 36, No. 4: 19-23, 2005. DeWitt, Craig. Crawlspace Myths. ASHRAE Journal, November 2003: 20-26. Energy Conservation in Traditional Buildings, English Heritage, March 2008. Giuliano, Meg, with Anne Stephenson. Energy Efficiency, Renewable Energy and Historic Preservation: A Guide for Historic District Commissions. Portsmouth, New Hampshire: Clean Air-Cool Planet, 2009. Grimmer, Anne E., with Jo Ellen Hensley, Liz Petrella and Audrey T. Tepper. The Secretary of the Interior’s Standards for Rehabilitation & Illustrated Guidelines on Sustainability for Rehabilitating Historic Buildings. Washington, D.C.: Technical Preservation Services, National Park Service, U.S. Department of the Interior, 2011. Holladay, Martin. Insulating Old Brick Buildings. Posted on Green Building Advisor on August 12, 2011. Insulation Fact Sheet, DOE/CE-0180. Prepared for the U.S. Department of Energy by Oak Ridge National Laboratory, 2008, Accessed February 21, 2013. http://www.ornl.gov/sci/roofs+walls/insulation/ins_08.html. Kohler, Christian, et al. Field Evaluation of Low-E Storm Windows. A study conducted by the Ernest Orlando Lawrence Berkeley National Laboratory presented at the Thermal Performance of the Exterior Envelopes of Whole Buildings X International Conference, Clearwater Beach, Florida, December 2-7, 2007. Krigger, John, and Chris Dorsi. “Air Leakage” in Residential Energy: Cost Savings and Comfort for Existing Buildings. Helena, Montana: Saturn Resource Management, 2004. Landsberg, Dennis R., and Mychele R. Lord with Steven Carlson and Fredric S. Goldner. Energy Efficiency Guide for Existing Commercial Buildings: The Business Case for Building Owners and Managers. Atlanta, Georgia: American Society of Heating, Refrigerating and Air-Conditioning Engineers, Inc., 2009. Lstiburek, Joseph. Building Science Insights BSI-047: Thick as a Brick. Sommerville, Massachusetts: Building Science Corporation, 2011. Accessed February 21, 2013. http://www.buildingscience.com/documents/insights. Lstiburek, Joseph, and John Carmody. Moisture Control Handbook: Principles and Practices for Residential and Small Commercial Buildings. New York: John Wiley & Sons, Inc., 1994. Measured Winter Performance of Storm Windows. A 2002 study done by Lawrence Berkeley National Laboratory. Midwest Weatherization Best Field Guide. Prepared for the U.S. Department of Energy Weatherization Assistance Program, May 2007. Accessed February 21, 2013. http://waptac.com/Technical -Tools/Field Standards-and-Guides.aspx. Rose, William B. Water in Buildings: An Architect’s Guide to Moisture and Mold. Hoboken, New Jersey: John Wiley & Sons, Inc., 2005. Rose, William B. “Should the Walls of Historic Buildings Be Insulated?” APT Bulletin: The Journal of Preservation Technology. Vol. 36, No. 4: 13-18, 2005. Sedovic, Walter and Jill H. Gotthelf. “What Replacement Windows Can’t Replace: The Real Cost of Removing Historic Windows.” APT Bulletin: The Journal of Preservation Technology. Vol. 36, No. 4: 25-29, 2005. Ueno, Kohta. Masonry Wall Interior Insulation Retrofit Embedded Beam Simulations: Research Report – 1201. Sommerville, Massachusetts: Building Science Corporation, 2012.